The Ritual of Dao Calming Collection Gift Set from Rituals is the perfect present for a friend or family member or for treating yourself! Restore the balance of your body and mind with these relaxing products based on White Lotus and Yi Yi Ren. 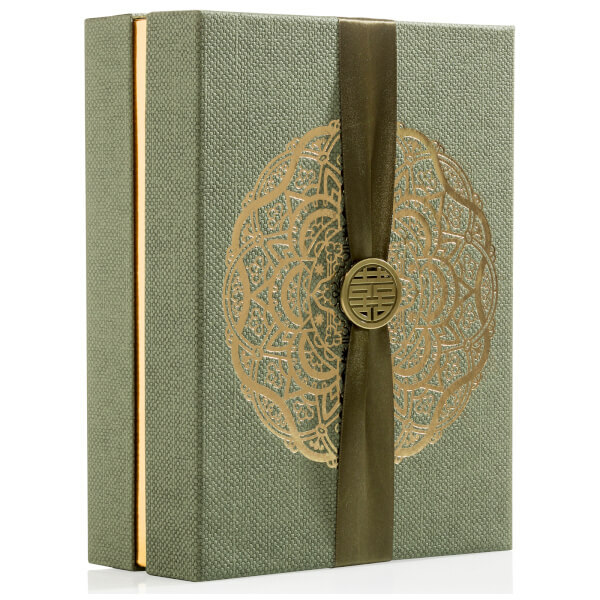 Give the gift box a second lease of life by keeping photographs, letters, or other items in it. A combination of ultrafine Chinese Bamboo particles within a rich cream base to gently and intensely remove dead skin cells. Hydrates without leaving the skin feeling greasy. Enriched with calming White Lotus and nourishing Yi Yi Ren extract. Designed to nourish the skin, our rich, creamy moisturiser leaves skin feeling silky soft. This moisturiser combines the gentle fragrance of White Lotus with the nourishing properties of Yi Yi Ren, a herb traditionally used in Chinese medicine. Style your home in a natural and unique way with these fragrance sticks based on the soft aroma of White Lotus and Yi Yi Ren. Enjoy the gentle fragrance which provides a calming effect on body and soul. Fragrance Sticks: Arrange the elegant sticks in the perfume-filled bottle. This is a formula in which it is not necessary to turn the sticks. If you want to have an extra perfume experience turn the sticks as needed, after this wash your hands with water and soap. Note: if you turn the sticks a lot it is possible that they last shorter than 3 weeks. Shower Foam: Aqua/Water, Sodium Laureth Sulfate, Cocamidopropyl Betaine, Isopentane, Sorbitol, Peg-120 Methyl Glucose Dioleate, Isopropyl Palmitate, Parfum/Fragrance, Isobutane, Coix Lacryma-Jobi Ma-Yuen Seed Extract, Nelumbo Nucifera (Lotus) Flower Extract, Sodium Benzoate, Peg-40 Hydrogenated Castor Oil, Citric Acid, Benzyl Salicylate, Guar Hydroxypropyltrimonium Chloride, Butylphenyl Methylpropional, Hexyl Cinnamal, Benzyl Benzoate, Caprylic/Capric Triglyceride, Linalool, Glycerin, Benzyl Alcohol, Alpha-Isomethyl Ionone. Fragrance Sticks: 3-Methyl-4-(2,6,6-Trimethyl-2-Cyclo-Hexen-1-Yl)-3-Buten-2-One, Alpha-Methyl-3, 4-Methylenedioxyhydro Cinnamic Aldehyde, 1-(1,2,3,4,5,6,7,8- Octahydro-2,3,8,8-Tetramet-Hyl-2-Naphthalenyl) Ethanone.